The project area falls within the Shropshire-Cheshire-Staffordshire Plain. 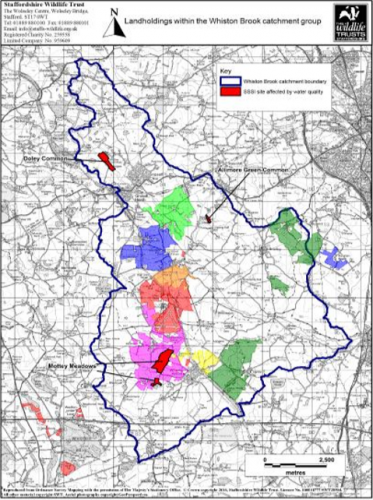 The Whiston Brook catchment feeds into the River Penk catchment, a priority area for reducing phosphate, sediment and nitrate inputs through CS options and capital works. Addressing flooding within the tributaries of the River Penk including the Doley, Wheaton Aston and Longnor Brooks is also a priority for this area which could be delivered through the CS options. Work carried out around the Mottey Meadows SSSI will contribute to two of the top priorities within the CS statement of priorities for the region; biodiversity and water quality. The quality of the lowland meadows habitat will be maintained within the Mottey Meadows SSSI using options on surrounding land to reduce diffuse water pollution. The maintenance and restoration of SSSIs and Lowland Meadow habitats is a key biodiversity priority. The Mottey Meadows SSSI is within the Meres and Mosses Natural Area, which will benefit from options aimed at reducing phosphate, nitrate and sediment inputs; a specific water quality target. Statutory protected sites which are influenced by water quality is also a top priority for the EA. Landscape features such as ponds and buffer strips will be created and enhanced to meet the above objectives. Additionally, the restoration and/or creation of ponds for example, will also contribute to landscape priorities. Overall multiple environmental benefits will be delivered in the target area, where the creation of low intensity grassland areas and wetland habitats are a focus for this region within the statement of priorities. Ultimately, the environmental landscape will be more resilient to climate change and pollution incidents as a result of the changes in land management that this project aims to provide. Target species that will benefit from improvements to the water quality and associated wetland management would include: Lapwing & Curlew.